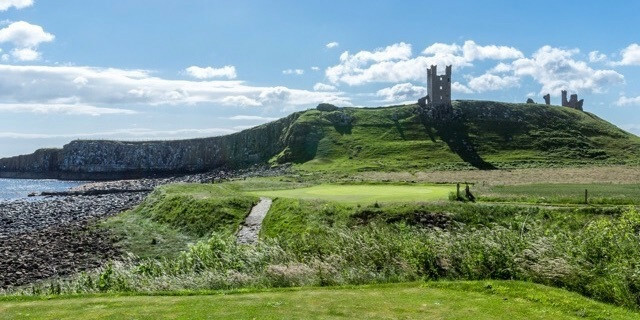 Review completed by Golfshake member Neil Farrington (handicap 18) who played Dunstanburgh Castle Golf Club in June 2017. 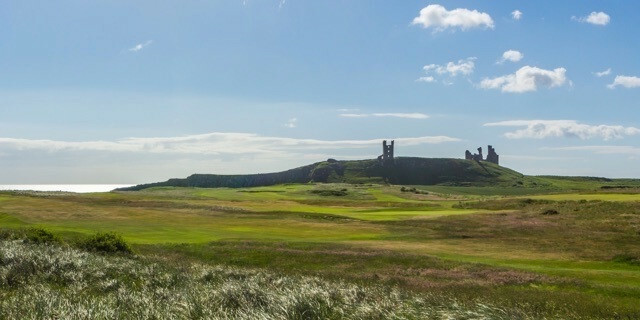 Dunstanburgh Castle is a traditional links that dates back to 1900 but saw its currrent layout finalised in 1922 by the legendary James Braid. It winds south along the idyllic Embleton Bay on the Northumberland coast, up to the dramatic ruin of 14th-century Dunstanburgh Castle and back. After a biblical deluge the previous day (and night), forbidding clouds scudding across the big Northumberland sky and the worst forecast since I backed Danny Willett to win his second straight Masters, expectations were low as our fourball made the 50-minute drive north from Newcastle towards the hamlet of Embleton, and one of links golf's best kept – and best value – secrets. That our accommodation over the Scottish border in Aberlady later that night was the Ducks Hotel only further hinted at our intended “halfway house” round en route to East Lothian being the dampest of squibs. But once the frustrating, largely single lane A1 was left behind, so too was the rain. Sure, what replaced it was far removed from a scorcher of a mid-summer’s day, but – much like Dunstanburgh Castle Golf Club itself – it would do. MUCH more than do. 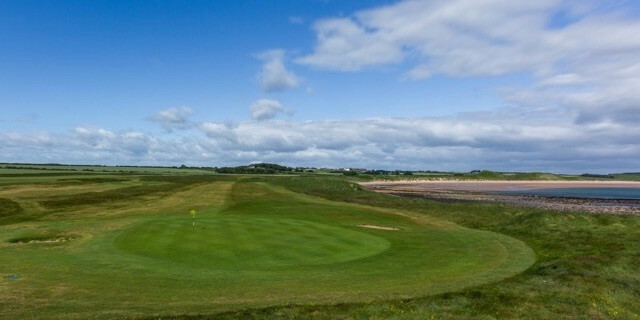 From the short drive to the links from Embleton and the £27 visitor green fee (£20 after 2pm! ), to the small brick-built clubhouse and lack of club shop or starter’s hut, everything screams modesty. But then you catch sight of the sweeping sands of the deserted, Poldark-esque bay as well as the castle beyond, and you remember that some golf clubs can let their golf course do the talking. That’s not to say there is any complacency in the welcome you receive at Dunstanburgh. Here, staff and members greet you with a smile, although clubhouse “staff” amounted to Lynn, who confirmed our tee time, gave us our scorecards, talked us through the layout, pointed us towards the first tee and would later take and serve our lunch and drinks order. All with a warmth – and a warm Geordie burr – which left one of our party particularly captivated. Much like Dunstanburgh's clubhouse, the opening hole – an uphill slight dogleg right par four – is not much more than functional. But both its condition, with our balls chasing up well on the fairway despite its drenching the day before, and the relatively light wind which greeted us on an impressively true and surprisingly quickish green, augured well for a course which one person had warned me to expect to be a little rough and ready. Yes, by the time we came off the tough par-three fourth, with its elevated green sloping away sharply enough to make a mockery of what had looked a couple of well-struck but slightly off-centre tee shots, we had all sampled the rough – literally – as well as the smooth of Dunstanburgh. But the course appeared well loved, and those greens were at least the equal of those we would play at more vaunted venues on East Lothian’s “Golf Coast” later in the week. The true magic of this place, though, still lies in its location, which is revealed in all its glory from the fifth hole onwards, as you skirt sweeping beach and wind through dunes which eventually give way to rocks, rockpools and the promontory and castle itself. Rarely will golf feel more like a raw battle between Man and the elements than when you open up your shoulders driving off Dunstanburgh’s fifth tee, while the challenge which awaits in the holes immediately leading to the turn is one of precision, with our task to find narrow fairways added to by a now stiffening headwind. Once homeward bound, the wind began to favour us, although that added to the run-off risk on fairways seemingly firming up under what was now milky sunshine, with the howl of frustration from one of our number when a decent drive found sand at the par-four 10th possibly audible seven or miles inland at Alnwick. The stand out hole is the short 13th, played across a ravine with a rocky beach beckoning to the left and Dunstanburgh Castle towering over the green, is a picture. And you might as well take one, as there's every chance a rambler will be obscuring your view of the flag while doing the same. Take note: non-golfers walking the course are no laughing matter, not least when they pop up in front of the 13th green to take a snap of the castle which provides the backdrop to Dunstanburgh’s signature hole – despite its wedge-range length. With right of way in their favour, patience has to be the 15th club in your bag. Speaking of 15, another par three offers a seemingly inviting target until you miss the dancefloor and realise getting up and down is going to be tough. Genuine net birdie opportunities come on the 16th - despite a blind secnd shot – and 17th give way to a longer and tougher par four on the last, which presents you with two fairway bunkers and then water before the green. And that is that. Around in barely three hours, just inside 90 shots and all smiles thanks to a course that combines character and charm with surprising conditioning – and outstanding value. A hugely enjoyable round - that all four of us played close to or slightly better than handicap didn't hurt – was matched by a fine lunch from a typically Northumbrian no-frills but very solid menu, as well as four pints of the club's eponymous bitter, served by Lynn. While we ate, the consensus was that £30 each for golf (and you can play as a fourball for considerably less during the winter) and a tenner for lunch at a club with the location, looks and quirk value of Dunstanburgh is the definition of value. With supposedly far superior golf awaiting us further up the coast at the likes of North Berwick and Gullane, we were blown away by Dunstanburgh's golfing challenge, dramatic setting, super-true greens and bargain price tag – though thankfully not by the wind, which will often blow far harder in these parts, and add length to a course already measuring almost 6,300 yards. The condition of the course, coming after incessant rain the day and night before, suggested this is a links genuinely enjoyable all year round – albeit with some serious layers worn in winter.